The Bronx High School of Science (commonly called Bronx Science or Science, and formerly Science High) is a public magnet, specialized high school in Bronx, New York, United States. It is operated by the New York City Department of Education. Admission to Bronx Science involves passing the Specialized High Schools Admissions Test. Each November, about 30,000 eighth and ninth graders take the 3-hour test for admittance to eight of the nine specialized high schools. The test is extremely competitive, with only 900 of the 30,000 applicants being accepted to Bronx Science each year. Founded in 1938 in the Bronx in New York City, Bronx Science is now situated in an educational area known as the Educational Mile in Bedford Park, a neighborhood in the northwest portion of the Bronx. The exam administered to students in the 8th grade was reportedly taken by more than 20,000 students every year as of 1999[update]. Although known for its focus on mathematics and science, Bronx Science also emphasizes the humanities and social sciences and continually attracts students with a wide variety of interests beyond math and science. Its alumni have received eight Nobel prizes and eight Pulitzer Prizes. The Bronx High School of Science is often referred to as Bronx Science, and rarely just Science. It was formerly called Science High and its founder, Morris Meister, is said to have frequently called the school simply as "The High School of Science." Bronx Science was founded in 1938 as a specialized science and math high school for boys, by resolution of the Board of Education of the City of New York, with Morris Meister as the first principal of the school. They were given use of an antiquated Gothic-gargoyled edifice located at Creston Avenue and 184th Street, in the Fordham Road-Grand Concourse area of the Bronx. The building, built in 1918 for Evander Childs High School, had been successively occupied by Walton High School (1930) and by an annex of DeWitt Clinton High School (1935). The initial faculty were composed in part by a contingent from Stuyvesant High School. Principal Meister put his imprint on the school from its formation, for example selecting as school colors "green to represent chlorophyll and gold the sun, both of which are essential to the chain of life." Bronx Science started with about 150 ninth year students and 250 tenth year students, the remaining facilities of the building being used by DeWitt Clinton. As more boys began to attend Science, the Clinton contingent was gradually returned to its own main building. During their joint occupation, which lasted for 2 years until 1940, the two schools had separate teaching staff and classes, but the same supervision and administration. In 1946, as a result of the efforts of Meister, the faculty, and the Parents Association, the school became co-ed, giving girls of New York equal opportunity to pursue a quality education in a specialized high school, previously denied to them. This expansion to co-education preceded its rivals Stuyvesant (1969) and Brooklyn Tech (1972) by more than two decades. In 1958, after 20 years as principal of the school, Morris Meister resigned to become the first president of the newly organized Bronx Community College. Mr. Meister personally selected a teacher, Alexander Taffel, to succeed him as principal. From the beginning, the Parents Association and Principal Morris Meister campaigned for a new building. After twenty years, but under Principal Taffel, plans were finally completed for a new $8 million building, designed by the architectural firm of Emery Roth and Sons. The new building would be on 205th Street near Bedford Park Boulevard, in a predominantly institutional area, between DeWitt Clinton High School and its large football field on one side, and Harris Field and Hunter College (now Lehman College) on the other. On March 3, 1959, students and faculty occupied the new building for the first time, solving the problem of how to move the books from the old library to the new in typical Bronx Science manner: on Friday afternoon each student took home five library books from the old building, and on Monday returned them to the new one. They entered a school equipped with modern classrooms, laboratories, and technical studio areas. The main lobby entrance featured a 63-foot (19 m), Venetian glass mosaic mural overhead, depicting major figures from the history of science such as Marie Curie and Charles Darwin under the protective hands of a God-like figure representing knowledge, with this quote from John Dewey: "Every great advance in science has issued from a new audacity of imagination." The mural is an original work by Frank J. Reilly entitled Humanities Protecting Biology, Physics, Chemistry. Legions of students over the years, bemoaning the lack of swimming facilities, have sarcastically referred to the mural as "the Science swimming pool", perpetuating the idea – perhaps apocryphal – that a choice was made to fund a mural rather than a pool in the new building. The move was not without incident. In the first spring of the move, rumors swept the school that various Bronx youth street gangs were coming to the school, and that the Fordham Baldies would shave the hair of Science students. This never happened. Another incident did happen that spring: The first time Science girls appeared on the outdoor physical education field in gym clothes, some students from the neighboring, all-male DeWitt Clinton High School charged the separation fence between their field and the Science field. The fence held, but the female students exercised indoors for the remainder of that year. When Bronx Science celebrated its silver anniversary in June 1963, President John F. Kennedy hailed it as "a significant and pathfinding example of a special program devoted to the development of the student gifted in science and mathematics." The President had recently selected one of its graduates, Harold Brown, of the class of 1943, for the position of Director of Defense Research and Engineering; he would later serve as Secretary of Defense under President Jimmy Carter. Bronx Science is the only NYC Specialized High School with a campus. A math and computer programming class at Science in 1960, with an IBM 650 op code chart, upper right. Science was one of the first high schools to teach computers. The school had a keypunch machine and students ran their programs at the Watson lab at Columbia University. Science obtained its own computer, an IBM 1620, a year and a half later. Bronx Science students take a college preparatory curriculum that includes four years of lab science, math, English, social studies, two or three years of foreign language and a year of fine arts, with required courses and a wide selection of electives, including advanced placement (AP) classes, which allow students to place out of introductory college science courses. Over 160 distinct courses are offered. Students have an opportunity to do independent research, and many compete in the annual Intel Science Talent Search (formerly sponsored by Westinghouse). In the biological sciences, the students have the additional option of taking a special "double honors" biology course, which features extra laboratory exposure. Science electives include microbiology, physiology, forensic science, human genetics, evolution, astronomy, organic chemistry, electronics and others. The mathematics department offers the standard AP courses in AB/BC calculus and statistics, courses in multivariable calculus and computer science, including AP Computer Science A. A course in linear algebra and differential equations was offered for the first time in fall 2007. Students take four years of English, with electives including honors creative writing, exploring science fiction, journalism workshop, and AP English. Four years of social studies or history classes are required, and include US and world history, economics – with electives in psychology, law, finance, and global studies, among others. Three years of languages are required. Bronx Science offers French, Spanish, Latin, Italian, Modern Greek, Chinese, Japanese, and Korean. At one time Hebrew, Russian, and German were also offered. Students in their sophomore year are required to take either Applied Science or a class to satisfy the Sophomore Research Requirement. Classes that satisfy the Sophomore Research Requirement include Introduction to Engineering, Social Science Research, Biology/Physical Science Research, and Math Research. Students have the option of continuing their research in their junior and senior years, which gives them the opportunity to work with mentors and submit their final research paper to prestigious competitions such as the Intel Science Talent Search. Students must also obtain credits from two terms of a class in the fine arts or the equivalent. The fine arts requirement is usually satisfied during Bronx Science's Summer Program which offers Drama, Music, and Art. Students usually "double up" on two of these courses to satisfy the fine arts requirement for once and all during the time period of one summer. However, it is possible to satisfy the fine arts requirement by taking a music elective such as Jazz Band or an arts elective such as AP Studio Art during the regular school year. Health and Physical Education courses are also required, with activities including step aerobics, weight training, basketball, skating, team handball, fitness, and yoga. There are several school publications, some produced by students, others produced by individual departments. The Science Survey is Bronx Science's entirely student-run newspaper. Students manage everything: reporting, layout, design, editing, and final production, under the supervision of the journalism advisor. The paper is printed using funds from its advertisers, with no fiscal school support. The paper is distributed on average five times per year at no charge. The Science Survey has been the name of the Bronx Science student newspaper since the founding of the school in 1938. Dynamo is the literary magazine sponsored by the English Department, consisting of original poems and stories submitted by students from all grades. The Observatory is Bronx Science's prize-winning yearbook. The yearbook office has a custom-built web server to manage its production, powered by MediaWiki and Coppermine software. The Biology Department sponsors two publications. BioNIC (the Biology News and Information Center) is an annual web publication featuring biology-related events at Bronx Science, student-written articles, opportunities, and links to helpful and interactive pages. Biology Journal, a joint venture between students and faculty, documents advances in the field within the school and in the outside world. Each themed issue contains interviews, commentaries, artwork, featured student research papers, and abstracts from every student biology research project that year. Other department-produced publications include the annual Math Bulletin, consisting of student term papers, original student mathematics research, and topics in mathematics; Exposition, an annual production of the Social Studies Department; and Reactions, written by physical science students. Bronx Science has received international recognition[a] as one of the best[b] high schools in the United States, public or private, regularly ranking in the top 100 in U.S. News and World Report's lists of America's "Gold-Medal" high schools. In 2014, they ranked 34th out of all high schools nationwide and 2nd in New York State; nationwide, Bronx Science ranked 33rd in 2008 and 58th in 2009. It attracts an intellectually gifted blend of culturally, ethnically, and economically diverse students from New York City. As of 2012[update], Bronx Science is ranked as one of the "22 top-performing schools" in America on The Washington Post as well as number 50 out of a list of the best 1,000 high schools in the country on The Daily Beast's "America's Best High Schools" list. In 2014 it was ranked second highest on Cities Journal's list of the "15 Best High Schools in New York", along with Stuyvesant (ranked third) and Brooklyn Tech (ranked eighth). The average SAT score in 2012 was 2,010 out of 2,400. Almost all Bronx Science graduates continue on to four-year colleges, and it is a "feeder school" with many graduates going on to attend schools in the Ivy League and other institutions each year. Bronx Science has counted 132 finalists in the Intel (formerly Westinghouse) Science Talent Search, the largest number of any high school. Eight graduates have won Nobel Prizes—more than any other secondary education institution in the United States—and six have won Pulitzer Prizes. Of the eight Nobel Prizes earned by Bronx Science graduates, seven of them are in physics, which earned Bronx Science a designation by the American Physical Society as an "Historic Physics Site" in 2010. Bronx Science is a member of the National Consortium of Secondary STEM Schools (NCSSS). 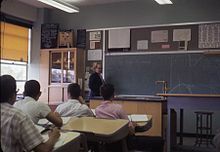 Together with Stuyvesant High School and Brooklyn Technical High School, it is one of three original specialized science high schools operated by the New York City Department of Education. The New York City Subway's Bedford Park Boulevard (B and ​D trains) and Bedford Park Boulevard–Lehman College (4 train) stations are located nearby. Additionally, New York City Bus's Bx10, Bx22, Bx26 and Bx28 routes stop near Bronx Science. and plans for schools in the former Soviet Union, Turkey, Japan, Korea, and China to be developed according to the Bronx Science curriculum. ^ a b c d "Search for Public Schools - School Detail for Bronx High School of Science". National Center for Education Statistics. Institute of Education Sciences. Retrieved March 8, 2019. ^ "The Bronx High School of Science". www.bxscience.edu. ^ Sederer, Lloyd I. (October 22, 2012). "A Safe Place to Be Smart: The Bronx High School of Science". Huffington Post. ^ "Eighteenth Commencement Exercises" (PDF). The Bronx High School of Science. January 30, 1950. Retrieved July 21, 2014. ^ "Mission". The Bronx High School of Science. Archived from the original on February 12, 2013. Retrieved July 21, 2014. ^ "Timeline – click on 1930s – 1937/1938". The Campaign for Stuyvesant – History. OurStrongBand.org. Archived from the original on February 21, 2009. Retrieved April 19, 2009. ^ "The Bronx High School of Science". Bxscience.edu. December 31, 1999. Retrieved March 10, 2016. ^ "About the architect". Nyc-architecture.com. Retrieved June 4, 2012. ^ "About Bronx Science". The Bronx High School of Science Alumni Association & Endowment Fund. Archived from the original on December 21, 2016. Retrieved May 2, 2017. For over 50 years it has been rumored that the administration chose to fund the mural rather than a swimming pool in the new building. It’s simply not true. ^ "Lists of classes". Bxscience.edu. December 31, 1999. Archived from the original on July 24, 2012. Retrieved June 4, 2012. ^ a b c d e f g h i j k l "The Bronx High School of Science Course Guide 2013" (PDF). Course Guide. The Bronx High School of Science. Archived from the original (PDF) on September 13, 2012. Retrieved October 11, 2014. ^ "Science Survey - Home". Archived from the original on February 14, 2008. Retrieved March 10, 2016. ^ "Dynamo". Archived from the original on April 25, 2012. Retrieved March 10, 2016. ^ "BioNIC Publication at Bronx Science". Web.archive.org. Retrieved March 9, 2019. ^ "The Bronx High School of Science". Bxscience.edu. December 31, 1999. Archived from the original on December 10, 2012. Retrieved March 10, 2016. ^ "The Bronx High School of Science". Bxscience.edu. December 31, 1999. Archived from the original on September 27, 2007. Retrieved March 10, 2016. ^ "SPEECH BY MR THARMAN SHANMUGARATNAM, MINISTER FOR EDUCATION & SECOND MINISTER FOR FINANCE, AT THE OFFICIAL OPENING OF NATIONAL UNIVERSITY OF SINGAPORE HIGH SCHOOL OF MATHEMATICS AND SCIENCE (NUS HIGH SCHOOL)". Singapore Ministry of Education. April 23, 2007. Archived from the original on September 30, 2007. Retrieved August 12, 2007. ^ "History of the Philippines' First Science High School". 40th Commencement Exercises Yearbook, Manila Science High School. 2003. Archived from the original on May 25, 2007. Retrieved August 12, 2007. ^ "About Bronx Science – Bronx High School of Science Alumni Association". Retrieved March 11, 2011. ^ "Brueck Promoted to UNM Distinguished Professor". University of New Mexico. October 26, 2006. Archived from the original on July 18, 2007. Retrieved August 12, 2007. ^ "The Bronx High School of Science in BRONX, NY". U.S. News & World Report. Retrieved April 24, 2014. ^ "Gold Medal Schools". U.S. News and World Report. December 14, 2008. Archived from the original on December 10, 2008. Retrieved January 11, 2009. ^ Herman Badillo (2006). One Nation, One Standard: An Ex-Liberal on How Hispanics Can Succeed Just Like Other Immigrant Groups. Sentinel. p. 28. ^ "By the Numbers: Public, Private and Religious High Schools" (PDF). The Blackboard Awards. 2006. Archived from the original (PDF) on September 26, 2007. Retrieved August 12, 2007. ^ Joseph Berger, "How Do You Get To Bronx Science? The Yellow Bus; A Private Transportation Service Fosters the Queens Connection". The New York Times, January 14, 2003. ^ Winston, Kimberley (May 18, 2012). "Education". The Washington Post. ^ "15 Best High Schools In New York: #2 The Bronx High School of Science". Cities Journal. 2014. Retrieved May 18, 2014. ^ "15 Best High Schools In New York: #3 Stuyvesant". Cities Journal. 2014. Retrieved May 18, 2014. ^ "15 Best High Schools In New York: #8 Brooklyn Technical High School". Cities Journal. 2014. Retrieved May 18, 2014. ^ "NewsWeek's Top 20 high schools: Northeast '". The Daily Beast. May 20, 2012. Retrieved August 17, 2012. ^ Heather Mac Donald (Spring 1999). "How Gotham's Elite High Schools Escaped the Leveller's Ax". City Journal. Retrieved August 12, 2007. ^ "Intel Science Talent Search". web.archive.org. January 27, 2001. Archived from the original on January 27, 2001. ^ Newman, Andy (October 10, 2012). "Another Nobel for Bronx Science, This One in Chemistry". The New York Times. Retrieved October 11, 2012. ^ "Bronx Science Alumni". web.archive.org. February 19, 1997. Archived from the original on February 19, 1997. ^ "Distinguished Alumni Achievers". web.archive.org. January 27, 2001. Archived from the original on January 27, 2001. ^ "A Nobel Laureate Returns Home to Bronx Science", The New York Times, October 15, 2010. Retrieved October 15, 2010. ^ "High School, Summer School Gain Historic Site Designation". APS News. American Physical Society. January 2011. Retrieved March 10, 2011. ^ "NCSSS Institutional Members". Archived from the original on August 10, 2009. Retrieved February 14, 2017. ^ Kahlenberg, Richard D. (June 22, 2014). "Elite, Separate, Unequal: New York City's Top Public Schools Need Diversity". The New York Times. Retrieved July 20, 2014. ^ "MTA Neighborhood Maps: Van Cortlandt Park / NY Botanical Garden" (PDF). mta.info. Metropolitan Transportation Authority. 2018. Retrieved October 1, 2018. Wikimedia Commons has media related to Bronx High School of Science.